Psalms 23 is a very popular scripture. We hear it everywhere we go, or perhaps see it as a frame hanging in your grandmother’s house with a pretty picture. See, David wasn’t speaking about just any shepherd, but in fact he was speaking to GOD Himself! When we find ourselves in a dark place, know that God isn’t before us, but in fact He is right BESIDE us. He is leading the way and calming our fears. An interesting fact about sheep is that they have poor vision. When they are put in new circumstances they are easily frightened, especially when it’s dark. But knowing that the shepherd is near the sheep, calms them down because sheep trust and love their shepherd, and know He will defend them, if need be. That’s where the rod and staff come to play. The rod is a thick stick used as a weapon. If a beast comes lurking around the pasture and the shepherd sees it attacking one of his sheep, he will beat that beast down with the rod until they’re dead. 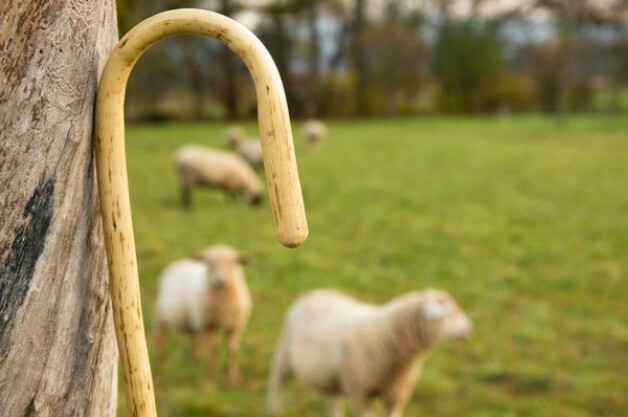 The staff is the shepherd’s crook, which is used to assist, correct, and guide the sheep. It is a tool used for the sheep out of love. So basically what I’m trying to say is take Psalms 23 and literally apply it to yourself. The Lord IS our shepherd, and He knows what we need better than ourselves. God wants us to have what is best for us. As long as we trust in Him as our shepherd, He will lead us to places of safety. He knows how to direct us away from places where we might fall. But if we still fall, He is always there ready to rescue us! Are you ready to be led by the Shepherd?